Since 1927, Southern Champion Tray has been manufacturing quality paperboard packaging products. As a third generation, family-owned company, our reputation has been built through clear vision, constant innovation, and unwavering commitment to excellence and integrity in everything we do. These principles have been the backbone of our success. The quality you can expect from SCT goes far beyond the value of products bought and sold. We strive to ensure that you are taken care of in every way, before and after the sale. Our team maintains a long-standing reputation of integrity and customer satisfaction. The thread of excellence runs through every part of our business and is apparent in our premium products, commitment to customer satisfaction, and constant innovation. You can rely on us to provide complete packaging solutions for your business. Founded in 1927 as a subsidiary of an Ohio-based company to manufacture paperboard food trays, the fledgling company survived the Great Depression and World War II, going independent in 1947 under new majority owner, Milt Zeiser. Our roots are in Milt’s love of the machine shop, where his skill in machining and mechanical design made SCT a viable business. Simply put, Milt was able to make paper-converting machines do things no one else had, and his customer-focused insight led to business success. SCT has always been a family operation. Milt’s son Chuck joined SCT full-time in 1958, ushering in the second generation of Zeiser leadership. By 1960, the SCT Team had 22 dedicated individuals serving 50 customers across the southern United States. Appointed President in 1968, Chuck brought a strong sense of stewardship to the business, solidifying both the infrastructure and culture of SCT, increasing the company’s manufacturing capabilities, adding an internal sales force, in-house graphic arts, a custom products division in Mansfield, Texas, and a full service trucking operation. Our private fleet of trucks, begun in the late ‘60s, allowed us to deliver with confidence to all our customers. Today, we deliver weekly to all fifty states, a competitive advantage that comes straight out of the sense of doing the best we can for our customers at every stage of the process. Please take a look at this wonderful video of A Day in the Life of a Southern Champion Tray Truck Driver: https://www.youtube.com/watch?v=5gYX2Mcrpw0&t=23s. Chuck brought the values-centered approach to business that is the hallmark of SCT. The commitment to Christian morals and biblical principles are the foundation of our culture. Chuck’s sons joined SCT full-time in the ‘80’s, beginning a third generation of Zeiser leadership. John joined the Company in 1982 and Bruce in 1986. In 1993 John and Bruce took the reins for SCT, which had grown to employ 175 people serving over 400 customers across 50 states. In the last few years, growth has accelerated, with expansion into Canada, Mexico, the Caribbean, Central America, and Europe. This required modernization and expansion in both the physical plant and human resources. SCT now employs over 650 people and produces over 500 stock products for 1,125 customers in the foodservice and bakery industries and provides over 1,000 custom packaging solutions for customers across varied industries. We are grateful because the future looks good and our history helps us keep perspective on it. SCT is well-positioned as a full-line folding carton manufacturer offering great packaging and distinctive service to all our customers. Our aim, to be “easy to love and hard to leave,” is rooted in our history and guides our commitment to our customers and our co-workers. Southern Champion combines innovation with stability. Our stability comes from our values, the common thread that forms the basis of our culture and overflows into each interaction with our customers. Our values are seen most clearly in our mission, our vision, and our core values. Our Mission is the reason we exist. It is what makes Southern Champion a distinctive company. Our Values are our organizational DNA. They make us who we are. 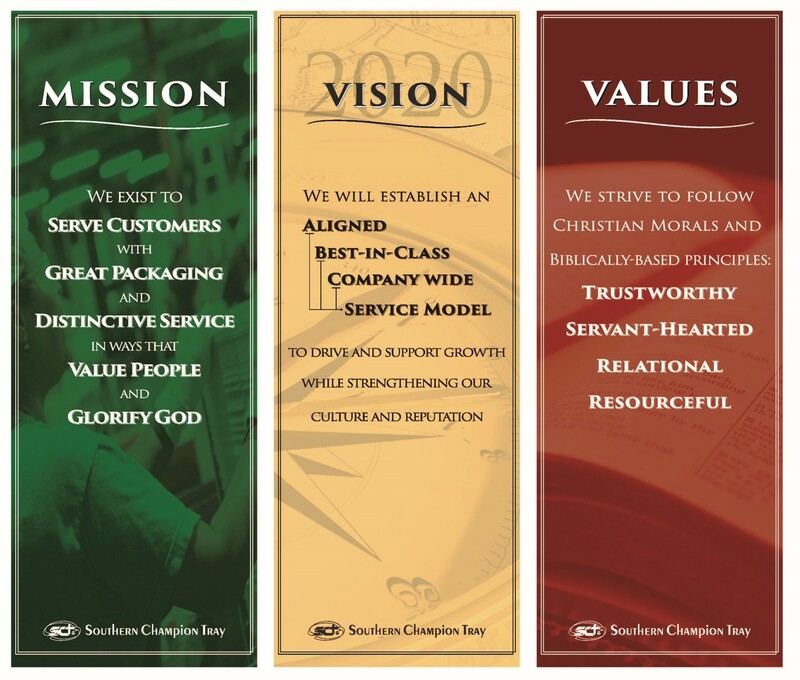 At Southern Champion, we strive to follow Christian morals and Biblically-based principles. Our Vision is our view of the future, what we aim to be going forward. We are committed to getting our products to our customers on time and in excellent condition, and we believe that the best way to do that is by regular service deliveries via our own fleet of trucks, assisted by dedicated contract and ocean freight carriers. For catalog bakery and foodservice products, we offer weekly service deliveries throughout the entire United States. For clients ordering custom products, we can schedule one-time shipments or recurring deliveries to multiple ship-to locations, as needed. Our customers can rest in the knowledge that their orders will be routed as specified, shipped with care, and delivered on time. We offer small minimum order weights, allowing for truckload pricing on less than truck load shipments. That means a great value for you and less space and money spent storing large supplies of product. We service numerous companies with extensive distribution needs, both nationally and internationally. When it comes to freight and distribution, we know what it takes to get the job done, and our vast experience serving these accounts will benefit your business as well. Our products are also available via an extensive network of partnering distributors both throughout the U.S. and internationally. Please send us your request using the “Contact” link and we will be happy to direct you to an SCT product distributor near you. Starting January 1, 2012, California law requires that large manufacturers disclose to the public the extent of their efforts to ensure that the goods they sell are not produced by workers who are enslaved, coerced, or otherwise forced into service or who have been the victims of human trafficking. Southern Champion Tray (SCT) is committed to lawful and ethical business practices that support our core values with the integrity and respect our customers, team members, and community deserve. Slavery and human trafficking are immoral, 180 degrees opposite to what we believe and how we act. We strongly support the goal of eliminating slavery and human trafficking wherever they exist. SCT is a member in good standing with the Fair Labor Association (FLA) whose Code of Conduct is based on International Labor Organization (ILO) standards. The FLA provides a model of collaboration, accountability, and transparency and serves as a catalyst for positive change in workplace conditions. As an organization that promotes continuous improvement, the FLA strives to be a global leader in establishing best practices for respectful and ethical treatment of workers, and in promoting sustainable conditions through which workers earn fair wages in safe and healthy workplaces. Our direct material suppliers are subject to our Supplier Code of Conduct. Under the Supplier Code of Conduct, the supplier commits that the materials incorporated into the supplier’s products will comply with the laws regarding slavery and human trafficking of the countries in which the supplier operates. We also periodically communicate with suppliers about this Policy and the Code of Conduct, and we ask suppliers to describe for us any other steps they are taking to insure that their supply chains are free of slavery and human trafficking. We do not currently engage third parties to evaluate those supplier efforts. We periodically audit suppliers for various purposes. Typically audits are not conducted solely for the purpose of determining compliance with the prohibition on slavery and human trafficking. However, we will promptly investigate any credible claim or indication that a supplier engages in slavery or human trafficking. If we then determine that a supplier has engaged in such activities, we will take appropriate steps up to and including discontinuing purchases from the supplier. Our team members with direct responsibility for supply chain management receive awareness training regarding slavery and human trafficking. We expect each individual at SCT to adhere to SCT Values that support SCT’s efforts to eliminate slavery and human trafficking. Any team member who violates this Policy to Combat Slavery and Human Trafficking is subject to appropriate discipline, up to and including termination of employment.